The Trump administration has provided $255 million military aid to Pakistan, with conditions attached - the U.S. State Department saying that Islamabad can access the funds only if it acts against terror groups based in the tribal areas and stop cross-border attacks in Afghanistan. "The Department notified the Congress on August 30 of our intent to obligate $255 million in FY 2016 Foreign Military Financing for Pakistan. At the same time, the Department is placing a pause on spending those funds and on allocating them to any specific FMF sales contracts," the Dawn quoted the State Department statement. The Trump administration notified the Congress on Wednesday that it was putting $255 million into the escrow account that Pakistan can access only if it 'does more' to eradicate alleged terrorist safe havens in the tribal areas and stopped cross-border attacks in Afghanistan. The Foreign Military Financing provides grants and loans to help countries purchase the U.S. weapons and defence equipment and for acquiring defence services and military training in the United States. Stressing that the U.S. would allow it to review the level of its cooperation with Islamabad before making new commitments, the State Department said, "Consistent with our new South Asia strategy, this decision allows us the flexibility to continue reviewing our level of cooperation with Pakistan prior to committing new security assistance resources to projects in Pakistan." 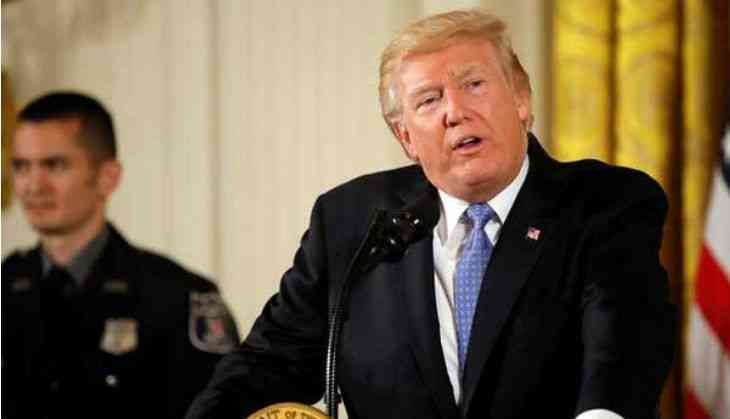 While announcing the new strategy for the war in Afghanistan, U.S. President Donald Trump excoriated Pakistan, saying "We can no longer be silent about Pakistan's safe havens for terrorist organizations, the Taliban, and other groups that pose a threat to the region and beyond." The military aid to Pakistan was committed by the previous Obama administration in 2015, but the Trump administration has attached new conditions to further delay the release. This move is initiated by the Trump administration to change the approach of the Pakistan government towards terror groups, the State Department said that while the U.S. valued its cooperation with Pakistan and wanted to see it continue. "The President has been clear that we are looking into the Pakistani government to take a decisive action against the militant groups based in Pakistan that are a threat to the region. It is vital to the U.S. interests that Pakistan prevents terrorist sanctuaries," the message said. "Pakistan has much to gain from partnering with our efforts in the region." The $255 million in military assistance was the largest portion of an estimated $1.1 billion of U.S. aid Congress had authorised in 2016. The U.S. claims that more than $33 billion in aid has been provided to Pakistan since 2002. Altgough the volume of annual U.S. assistance to Pakistan at $1.1 billion, hundreds of millions of dollars are withheld every year under different restrictions imposed since 2011, when relations between the two countries began to deteriorate after Osama bin Laden's discovery in Abbottabad.